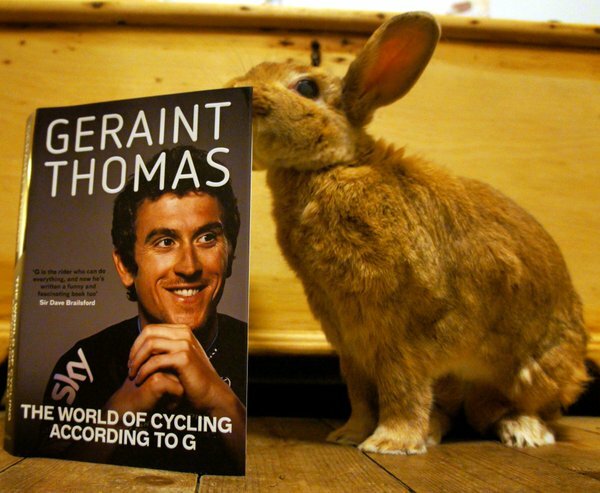 The peloton’s most straight talking cyclist has written a book, and it’s very entertaining. It’s not the usual autobiography that you might expect from a successful cyclist, but a collection of thoughts on every aspect of road and track cycling and life on the road. Though inevitably the book does cover Geraint’s own experiences and anecdotes, so there is some degree of biography present. With no story line running through the book, and short sections/chapters it’s really easy to fit into a normal busy day. Making the “Be with you in a minute, just let me finish this chapter” challenge quick and easily achievable. Many of the topics covered are linked to team GB, team Sky and all the usual suspects involved. There has been quite a lot of coverage of this over the last few years. If you’re tired of reading about these people then don’t buy a book written by a multiple Olympic medallist and team Sky rider, the coverage of these subjects/people is a given. Many of the general cycling facts you may already know, but I suspect that most cycling enthusiasts will find out something new and interesting in an entertaining way. There are no big juicy Exposés of anyone, or character assassinations, just a nice entertaining discussion about riding bikes and references to rugby. There is a bit of marketing of current sponsor’s products. Whether that is Geraint’s true feelings on the products or just a marketing exercise I guess depends on how cynical your outlook is. Personally it left me dubious but not closed off to his suggestions. At the point you invest your hard earned cash in finding out, the marketing will have worked. It made me laugh and smile quite a lot with some cheeky humour and covered some subjects I can’t imagine anyone else having the right sense of humour to be able to discuss, like flatulence etiquette in the peloton. Overall the book is quite inspiring, a lad from Cardiff who has made it as a pro cyclist without having to move full time to the continent to make his dream a reality. That’s not a story that could have been written before team GB started to dominate, and it makes his journey easier to identify with as a UK rider. Reading it in the evening, I found myself wanting to get up early and go cycle in the November wind and rain (then read some more of the book in a warm bath washing away the morning’s road grit and grime). A very readable book for cyclists, a great overview for new comers and perhaps something to inspire the new generation of UK cyclists.